Every year, I hand make a small number of cards which get sent to a select number of friends and family. In return, I sometimes get a Christmas card back. Every year, I go through the whole, “now what can I do with these Christmas cards” thing. This year, I thought I’ll take a quick look at different ways of keeping your Christmas cards out of landfill. Recycled ribbon spool ornaments – this one uses recycled christmas cards and old ribbon spools! Recycle and Reuse Christmas Greeting Cards – this is a great resource – lots of links to crafty projects you can do with your christmas cards, including creating gift tags, miniature gift boxes, magnets and more. Recycled Christmas Card Ornaments – make christmas tree ornaments with your old cards. Recycle them in your yellow-lidded recycling bin. 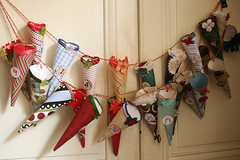 Donate them to your local child care centre, school or nursing home for their craft activities. Make them into new cards for the following year. While this isn’t made from Christmas cards, I love this advent calendar made from paper lying around your house. Any other fun ways to recycle your old cards? What great ways to re-use! You’ve done a formidable job and our entire community shall be thankful to you. your blog, I seriously appreciate your technique of blogging. to be shared around the net. Shame on the search engines for no longer positioning this publish upper! I’ve learn this put up and if I may I want to recommend you few interesting issues or tips. Hi, I do think this is an excellent website. I stumbledupon it ;) I am going to return yet again since i have saved as a favorite it. the post I read. 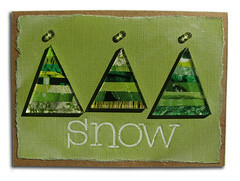 And on this article Recycling Christmas cards – RuthEllison.com. 2 questions for you if you don’t mind. Could it be only me or does it seem like a few of the responses come across like they are coming from brain dead people? at the same time as looking for a related matter, your site got here up, it looks great. as with the layout for your blog. Is this a paid subject matter or did you customize it yourself? this post, you will have each)The system is easy to follow, very. product or service, as well. You need to commit time, effort and energy into actually employing the system, such as. in your life.So, may be the Truth About Cellulite really worth your hard earned money?